The only thing worse than a bad breakfast is no breakfast. Luckily, that’s not going to be an issue for you. We’ve put together a lineup of some of the best vegan and vegetarian breakfast ideas we’ve ever seen. Each recipe is genuinely tasty – we like our food quick and nutritious, but it has to taste good too. If it didn’t make the grade, it didn’t make this list. 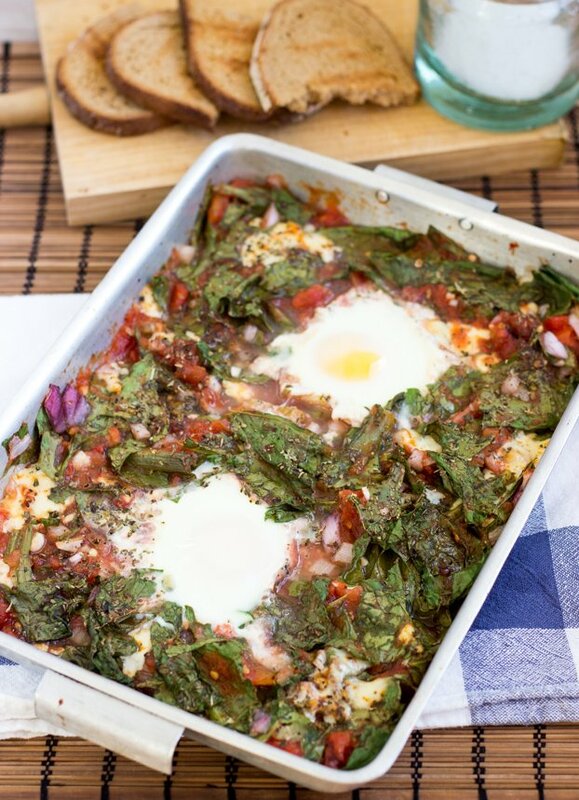 So, without further ado, welcome to our list of veggie breakfast ideas. The breakfasts range from 3 to 25 minutes depending on how long you’ve got to spare, and all are easy enough that they won’t tax you first thing in the morning. Enjoy. 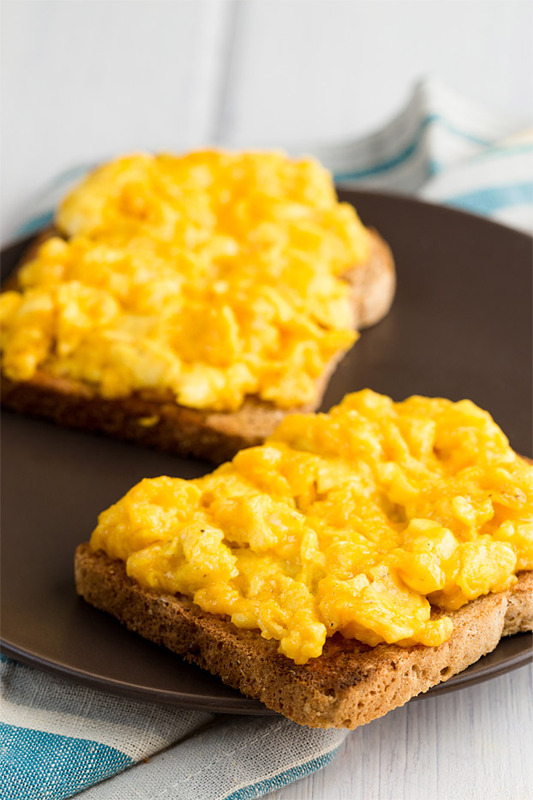 Make the best scrambled eggs you’ve ever had with our quick and easy, but simple to follow recipe – so good you’ll never look elsewhere again! 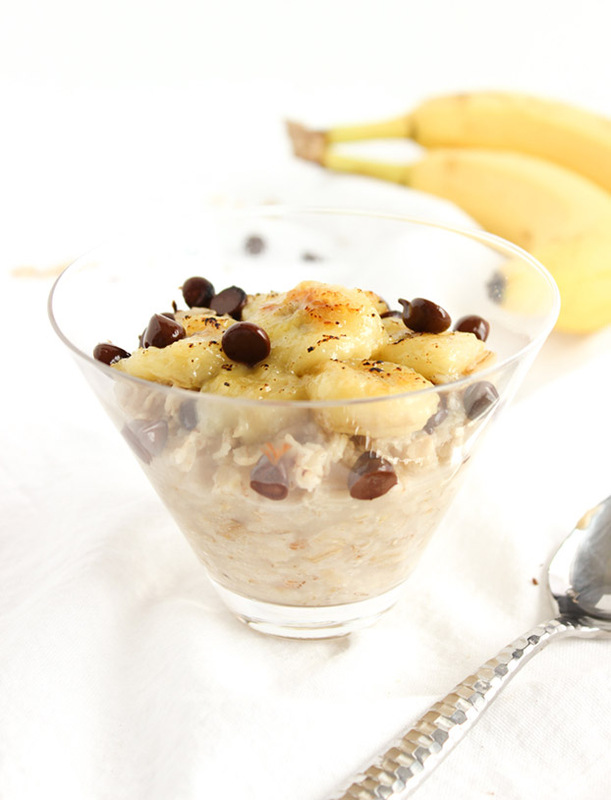 Sweet caramelized bananas and smooth dark chocolate chips make this caramelized banana dark chocolate oatmeal feel more like a luxurious dessert than a healthy breakfast! 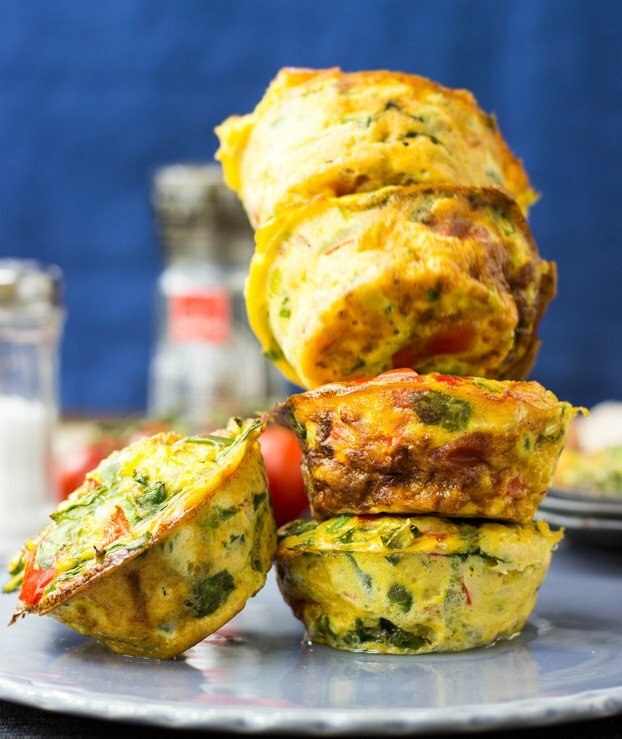 Delicious and Healthy Breakfast Egg Muffins. Simple recipe, great taste. Low carb and high in protein. Perfect as a full meal or filling snack. 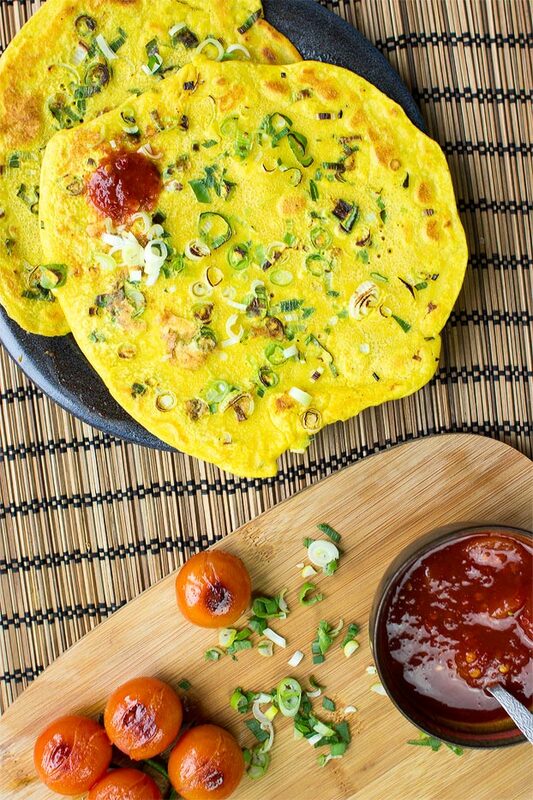 A savory pancake begging to be eaten with pickles and chutneys or yogurts and cream. East meets West with this beautifully, wonderfully healthy dish. Ideas were dreamt up for breakfasts like this. This modernized version brings the classic dish up to date with quick preparation and easy ingredients, while keeping the same well-loved taste. This is why new vegetarian breakfast ideas rock. For all those rhubarb lovers out there! 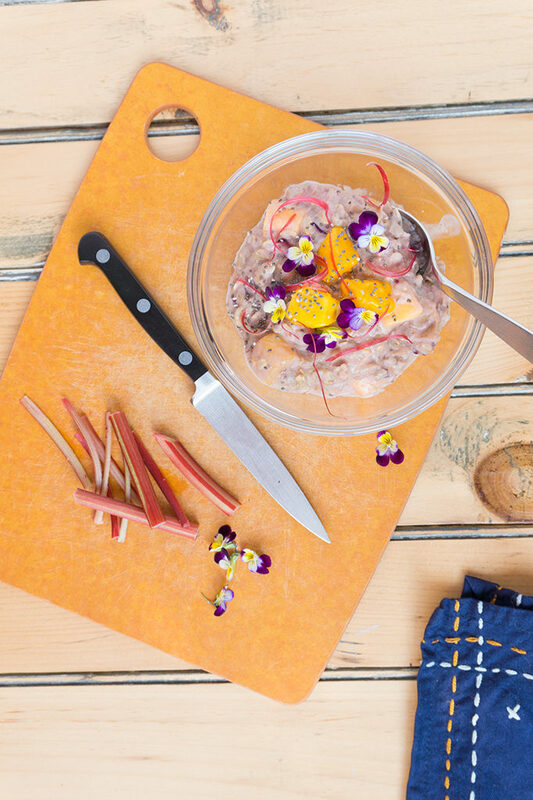 This Rhubarb Mango Oatmeal is perfectly sweet & you can still taste the rhubarb flavor. Decorate it with edible Johnny Jump Up flowers and you have a masterpiece. A truly delicious vegan breakfast recipe. 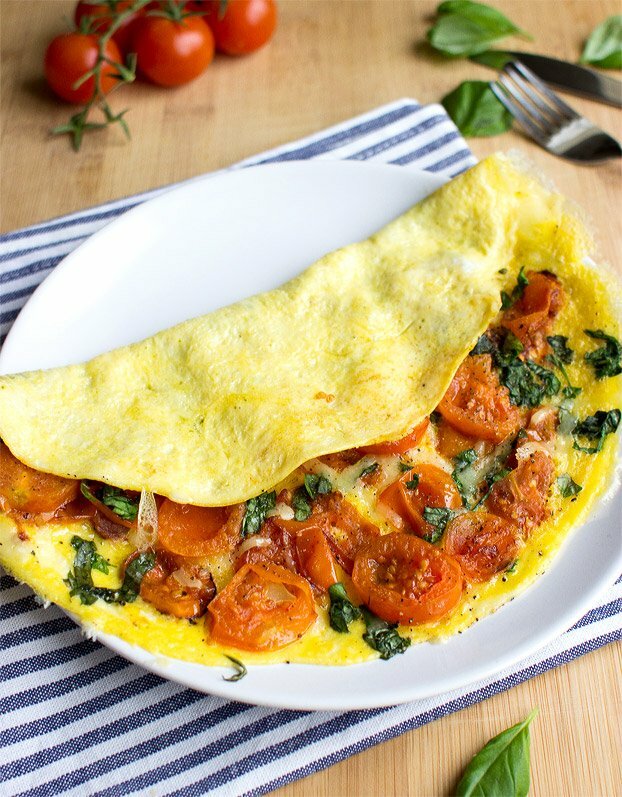 There is a trick to making the perfect omelette – and it’s weirdly easy. We’ll show you how. You’re gonna love this one! 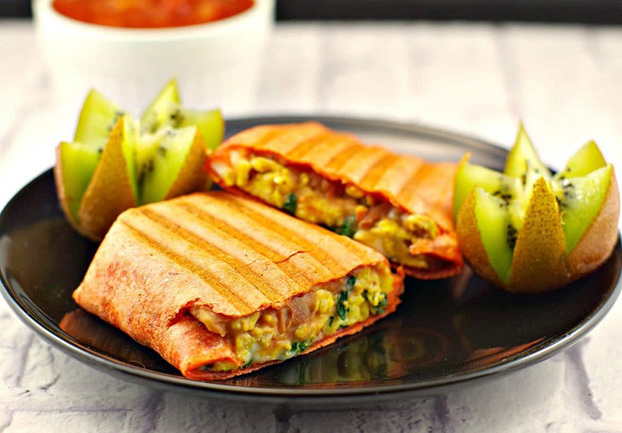 This easy, meatless, healthy breakfast burrito is full of protein, mediterranean flavours, make- ahead, freezable and a great brunch or breakfast potluck idea! The world’s simplest pancakes recipe contains just two ingredients (egg and banana) and is super quick – just minutes from bowl to plate! Simple and tasty. Easy to make and intensely delicious. 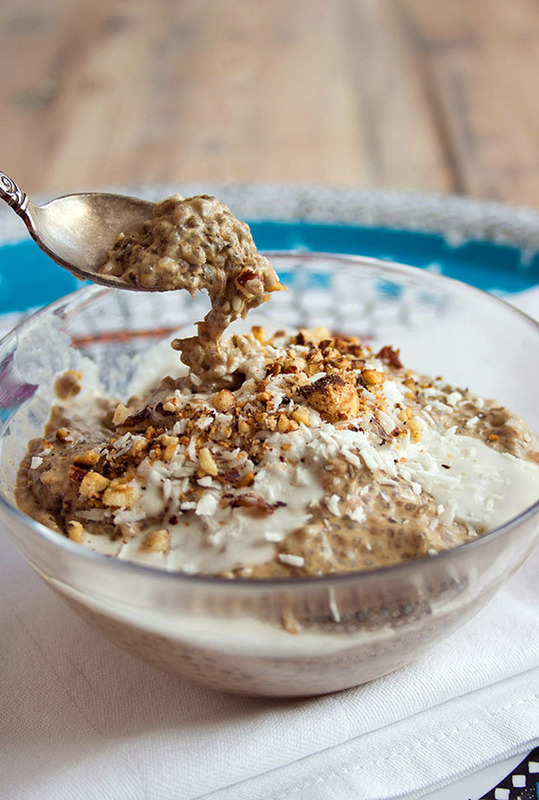 Prepare this coffee chia breakfast pudding in advance and enjoy it the next morning. A sugar free, low carb, vegan, gluten free and paleo-friendly breakfast recipe. 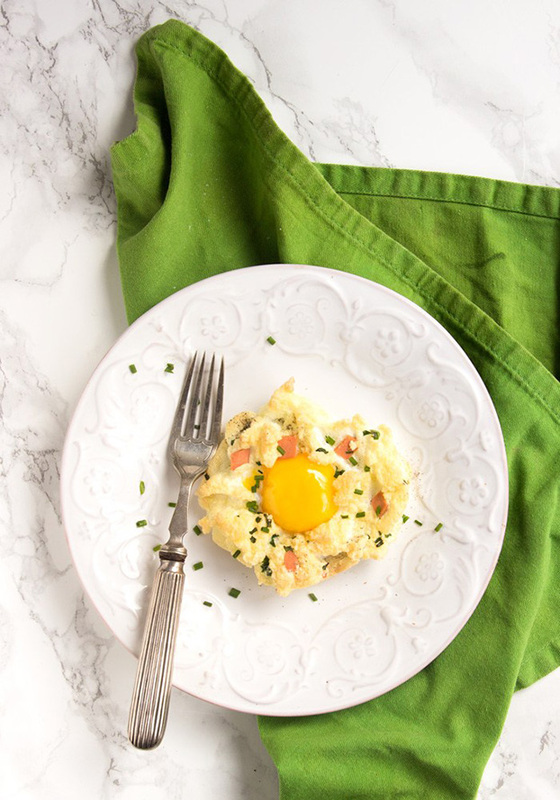 These fluffy and light Eggs In a Cloud make an impressive, yet simple, breakfast/brunch/light lunch in less than 15 minutes – plus, they’re loaded with protein and are naturally gluten-free and meat-free! This 5-ingredient recipe is such a simple way to spoil your family! 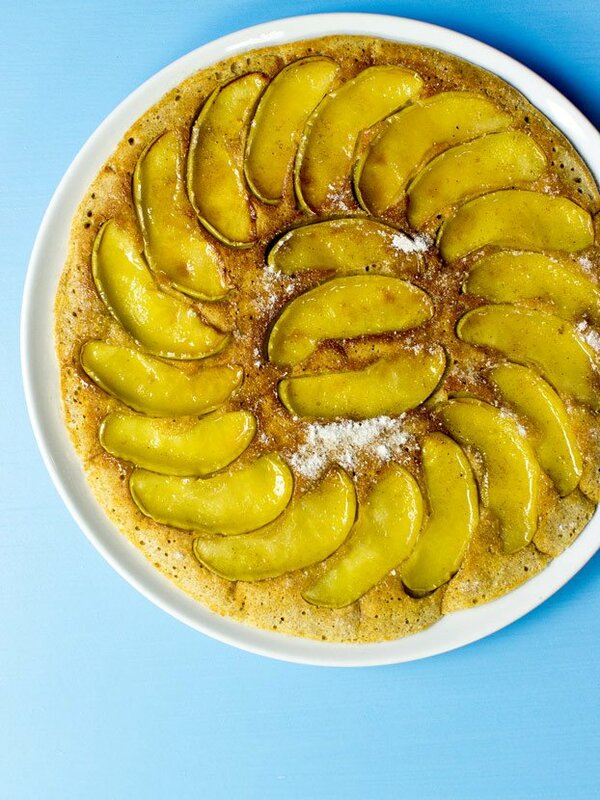 The pancakes would even be a fun dish to share at a kids’ slumber party, at a church potluck, or at a bridal shower. 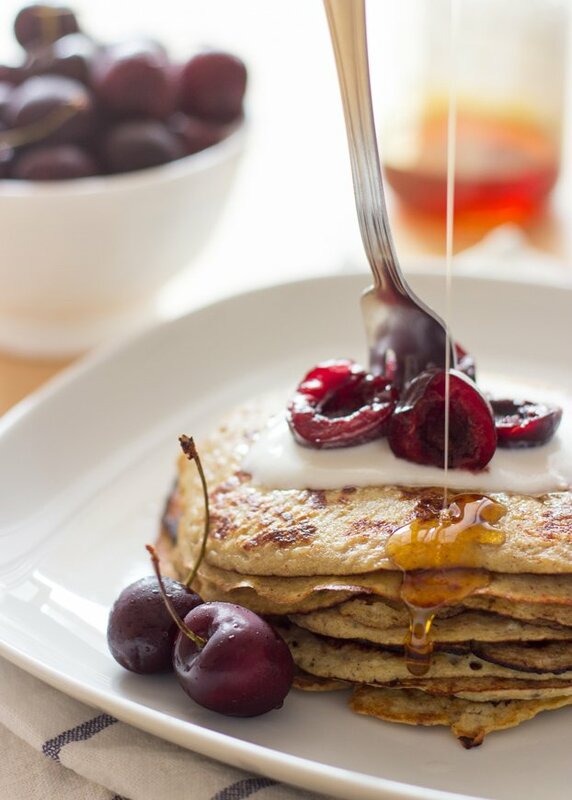 Let’s face it, everyone loves fluffy buttermilk pancakes — especially when the meal only requires 5 minutes of prep! A delicious breakfast to help combat hangovers by replenishing the most important nutrients and amino acids. Easy to make and very tasty. You know you wanna. 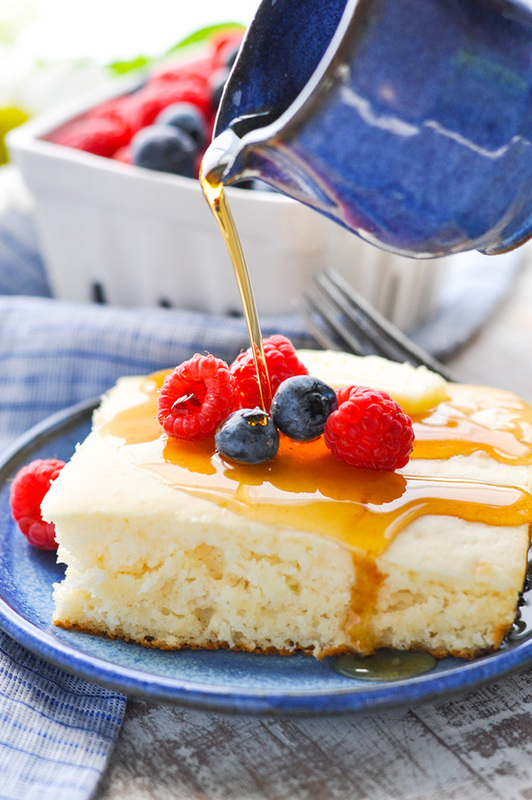 Breakfast recipes at their best. Blueberry Banana Protein Smoothie. 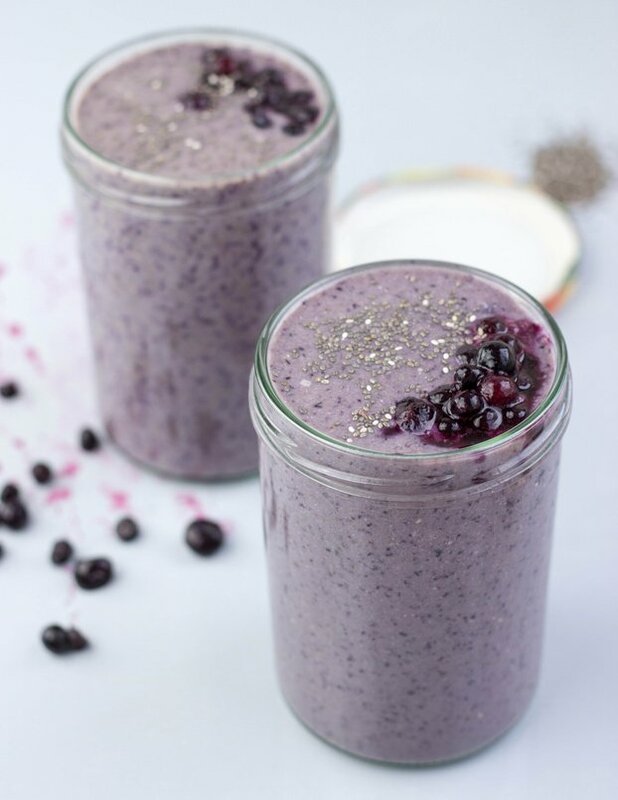 A superior blueberry and banana smoothie with a huge protein kick! Try it, love it. And thank us later. Just one more of many vegetarian breakfast ideas. 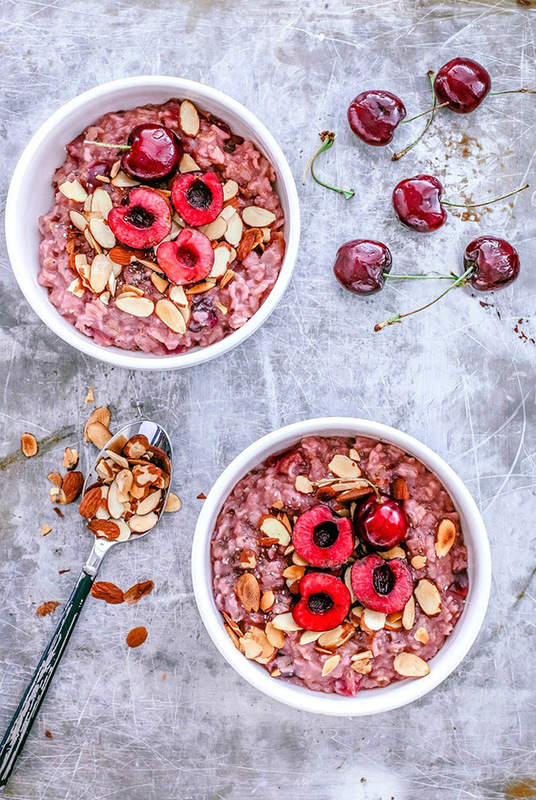 This delicious and belly-warming bowl of Almond Cherry Oatmeal calls for only six ingredients and 15 minutes! A lovely vegan breakfast idea. 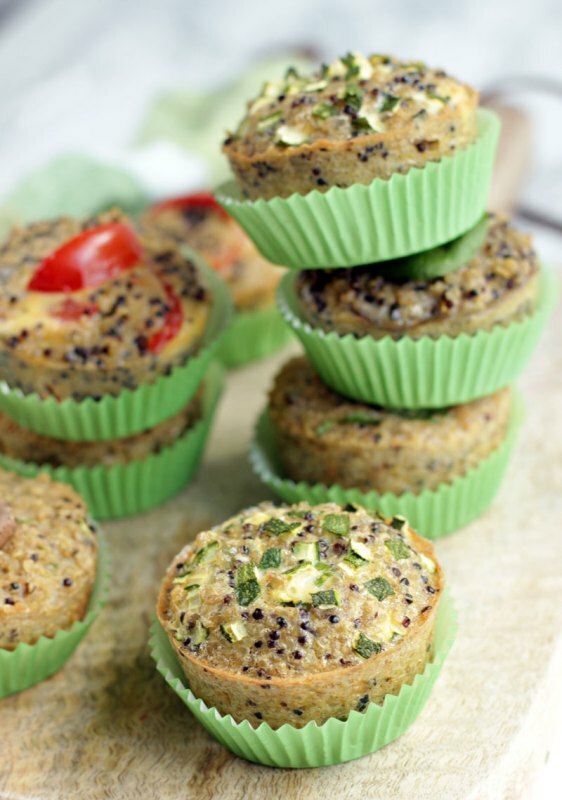 Try these healthy and flavorful breakfast treats to fuel up your morning. 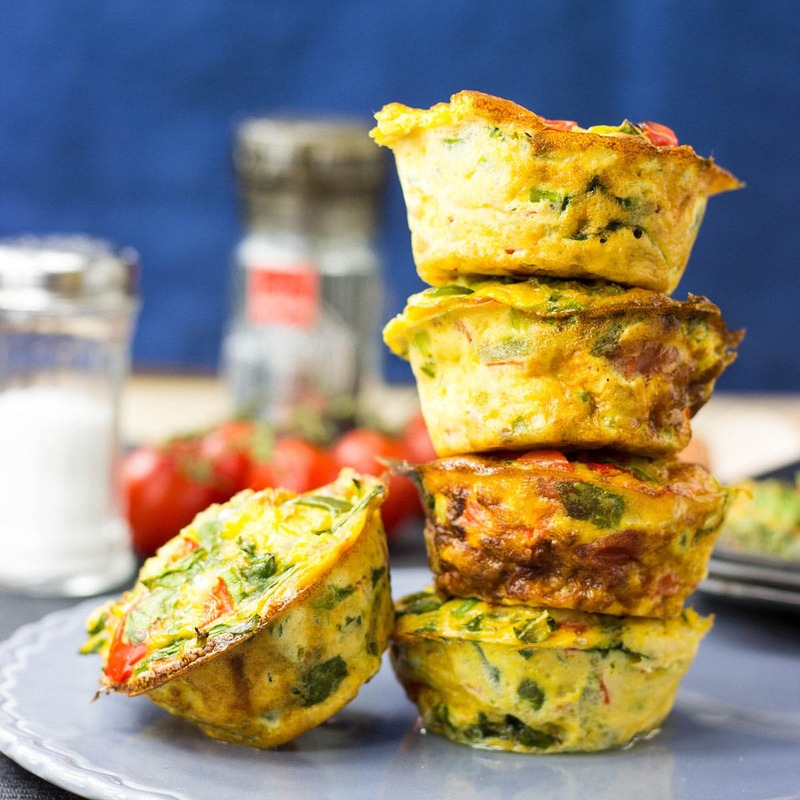 Packed with loads of fresh seasonal vegetables and plenty of healthy benefits, they’re completely gluten-free and make a well-balanced quick breakfast on the go. 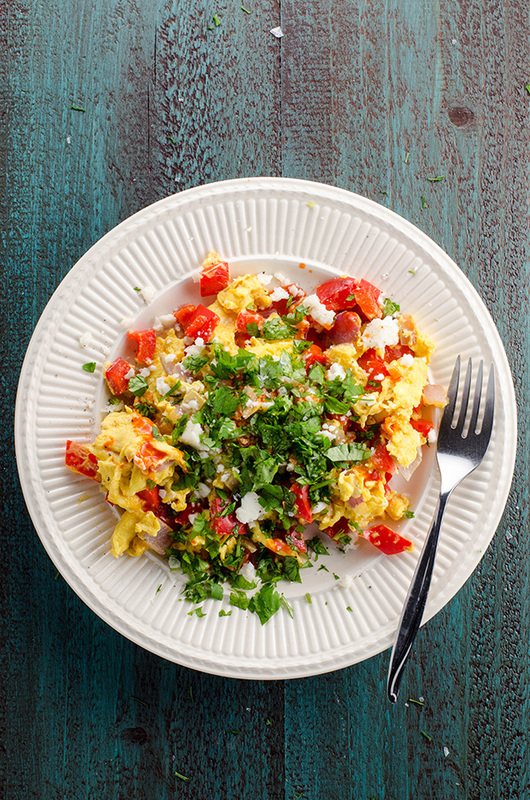 This 10-minute meal of scrambled eggs with peppers and onions, cheese and hot sauce with a generous sprinkle of cilantro works equally well for breakfast or dinner. So there we have it! 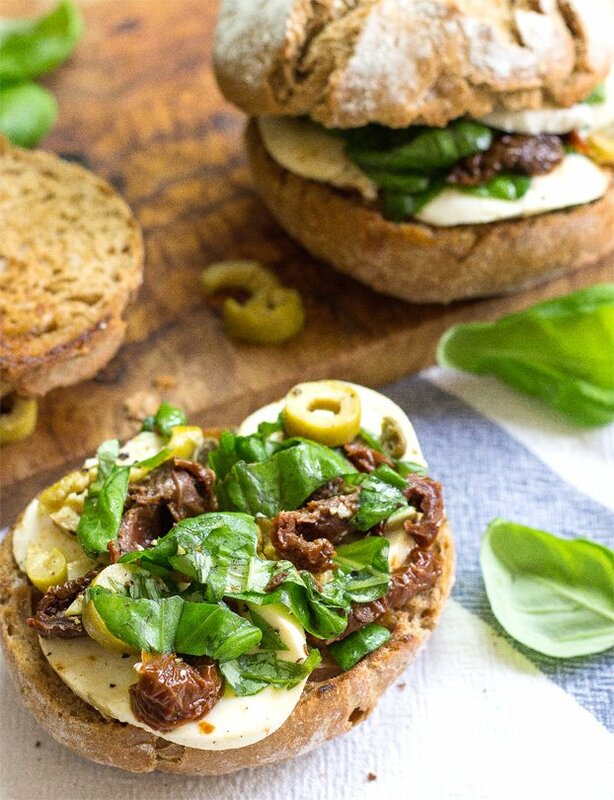 Our favourite vegan and vegetarian breakfast ideas all in one place. 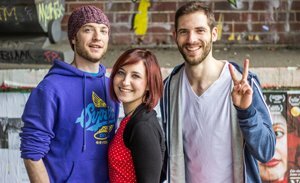 I hope they hit the spot – if they don’t just leave us a comment and let us know why! I have just cooked the veg muffins for 5 young ladies – all vegetarian – staying with me for bnb. 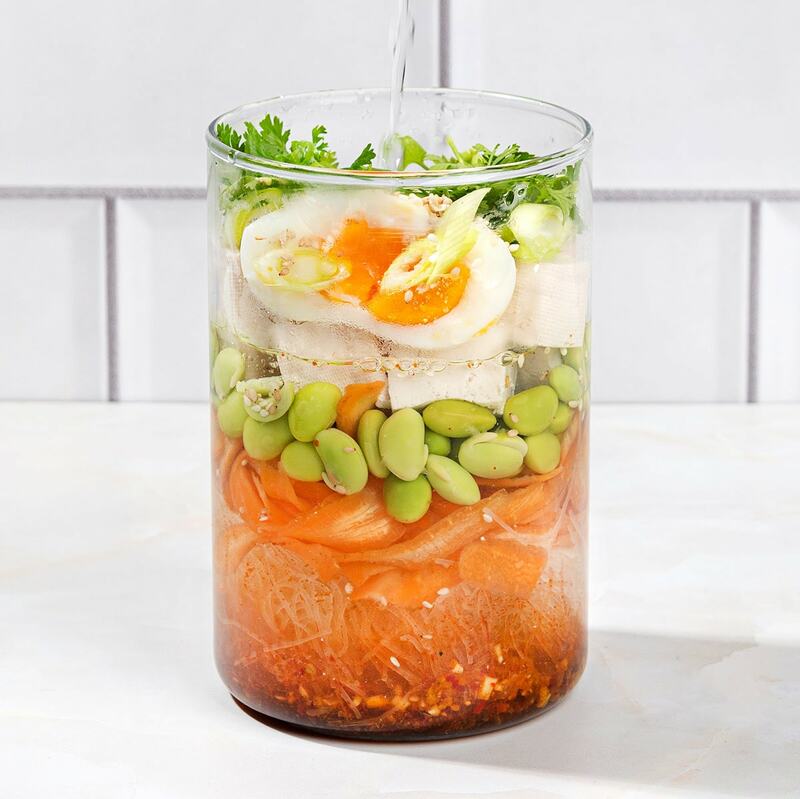 Super and I love the sound of lots of the others I shall be doing for my grandchildren in half term – excellent, quick, practical and ingredients already in the fridge – no special shopping trips! A bonus all round! I run a small b&b and usually serve bacon & sausage (locally bred) but I want to change and do veg/vegan breakfasts instead. That’s the reason I’m checking out this site. Awesome! I hope you’ve found something you can use, Alex. Good luck with the b&b! Can wait to try them all. 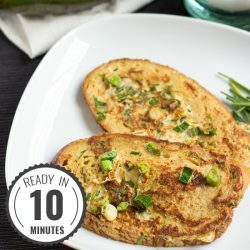 How the heck you guys use eggs, cheese in your recipes and call it vegetarian? How is that possible? Hi Stanislaw, we use the generally accepted definition of ‘vegetarian’ – no meat or animal rennet. Our recipes without animal products are labelled as ‘vegan’. Cheese is fine, eggs… I’d avoid calling it vegetarian. Hi Nuno, thanks for the comment. We’re using the two simplest terms of labelling food – vegetarian includes ovo/lacto (so eggs and dairy), vegan is without any animal product whatsover. It’s the most widely accepted terminology at the moment. Vegeterians dont eat meat and fish…..vegans dont eat any animal products like eggs and cheese. thats the difference. Eggs are not vegetarian they are chicken embroys that arent fully devolped. Hi Carrots, eggs fall into the broadest definition of vegetarian. They are not vegan though. Carrots- eggs are not “embryos that aren’t fully developed”. Egg laying hens aren’t exposed to roosters, therefore the eggs produced are not fertilized and will never become an animal. Just like human females have to pass the eggs that aren’t fertilized, so do hens. This blog is really awesome for me I just try two recipes from it “Eggs in a Cloud” and “Runner’s Sandwich”, and both were just wow in taste. Thanks and keep sharing.